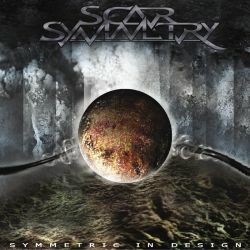 Scar Symmetry are real newcomers as this young band only was founded in early 2004 in Sweden. After the release of a self produced demo recording, they immediately got a well deserved label deal. What Scar Symmetry do is a revolution in metal by creating a new kind of death metal. Scar Symmetry's song are brutal and catchy at the same time and on a very high technical level. The drum sound and the production are bombastic, with lots of keyboards accompanying each song. Although the songs are very complex and well constructed, there is still space for harmonic parts. The vocals, delivered by two differently sounded singers, are very extraordinary. The change of often (male) growls and (female) melodies is well known from lots of gothic and wave bands. Scar Symmetry however have two male singers; the 'bad one' is responsible for classic, but well done death metal growl while the 'good one' sounds more like an epic metal singer. Although the meeting of two such extreme singing methods is difficult to imagine, the result is absolutely convincing. The strength of Scar Symmetry's songs is that you never exactly know what to expect next as the song writing is so diverse and rich in breaks. There are still a couple of classic death metal songs on this album (2012, Obscure Alliance), and Hybrid Cult is a pure power metal song. On Detach From The Outcome, there are even elements of nu metal in the music, but Scar Symmetry rock best when they present their unusual mix.